After a long day at work, going out to dinner, enjoying drinks, or catching a show can be a great way to unwind. What none of us ever want to experience: finding your car at the end of the night, only to discover you’ve lost your keys or locked them inside the car. Thanks to smartphone technology, it’s easy enough to find a list of local locksmiths who operate at all hours so you can quickly get in your car and on the go. Of course, late at night, you don’t want just anyone coming out to meet you! In fact, no matter the time of day or night, when you’re looking for a locksmith, you don’t want to leave your home or vehicle and your personal security in the hands of the first listing you find online. So how do you know who to trust? While requirements vary state to state, trustworthy locksmiths will, at the very least, be able to produce some level of licensing or bonding as well as liability insurance. In order to receive a locksmithing license, each individual will generally be checked and tested by a state board before receiving their license. This process includes an exam approved by the state and will generally also include a background check for things like previous felonies or criminal activity—this is done to prevent things like a former burglar from getting licensed. In addition to licensing, many locksmiths choose to be bonded as well. This is not generally a requirement, but it is an easy way for locksmiths to be recognized as trustworthy. A bond is generally underwritten by an insurance company or a bonding-exclusive company as a way of guaranteeing quality and trustworthy work. If you see a locksmith who is both licensed and bonded, you can trust that they have been vetted appropriately and are highly unlikely to be a scam. In most states, the licensing process for a locksmith also requires some level of liability insurance. This protects the locksmith and their tools as well as any damage done to customers’ property. While damage to your property is unlikely, it does occasionally happen. Insurance simply serves as a third layer of protection for both you and the locksmith. 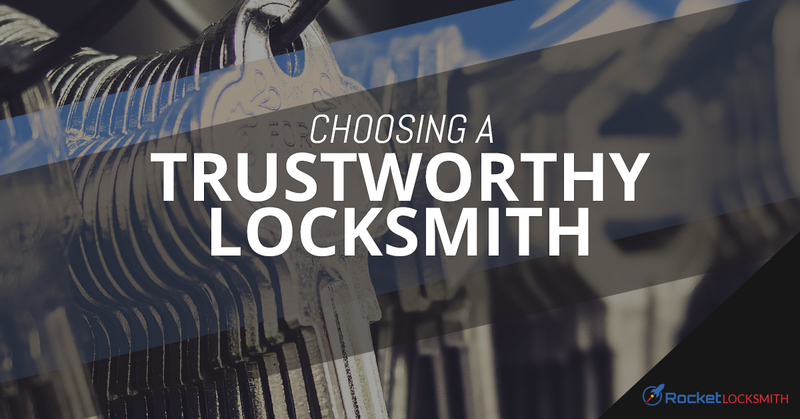 If a locksmith is licensed, bonded, and insured, these three combine to serve as a strong assurance that they are trustworthy. Generally, any locksmith with a website will very plainly say they are licensed, bonded (if applicable), and carry insurance. Whether they state it or not, do not hesitate to ask whether they are when you call and, if they claim to be licensed, bonded, and insured, ask for proof. Any locksmith worth the title will easily furnish proof of all three before beginning work, if you ask for it. As another layer of protection, many legitimate locksmiths will go through the steps to register with a state or national locksmiths association. Findalocksmith.com is a website hosted by the Associated Locksmiths of America as a way to help people find a trustworthy locksmith near them. Other sources include the Institutional Locksmiths’ Association and the Society of Professional Locksmiths. On their sites, you can find further information about the laws regarding locksmithing for Missouri, Illinois, or whichever state you live in as well as a list or search option for all locksmiths who have registered with them. If you’re looking for a trustworthy locksmith in St. Louis, trust your job to Rocket Locksmith. Contact us today to schedule service or get emergency locksmith services quickly!